In the 18th Century, Scotland was home to an outpouring of intellectual and scientific accomplishments (names like David Hume, Adam Smith, Robert Burns come to mind) and witnessed such leaps in thinking and practice that the Scottish Enlightenment sits alongside the ‘European Enlightenment’ in many history books. We can now see that there is a lot wrong with so-called ‘Enlightenment Thinking’ and certainly with ‘Enlightenment Rationalism’. While we may recognise the limitations of 18th Century rationalism, many don’t want to throw out the baby with the bathwater and join the New Age in an unthinking conversion. Jim Mather is an old friend of Triarchy, as is Graham Leicester (Director of International Futures Forum, also based in Scotland.) In his new book Transformative Innovation, Graham writes with remarkable ease and clarity about precisely what is wrong with Enlightenment Rationalism and how we can do better. He describes five principles or shifts we can make to extend our worldview beyond Enlightenment Rationalism to embrace more of what we are and what we know. Many of the triumphs of Enlightenment rationalist thinking came from taking the objective viewpoint, separating the observer from the thing observed. That is a partial view. It needs to be complemented by a shift in our worldview that enables us to see ourselves as subjects and participants – a relational universe. This relates to Carl Rogers’ concept of the ‘person’ rather than the ‘individual’. A person exists only in relationship, living a life in a pattern of other lives. There are likewise ‘mutual’ qualities of life, which cannot be fully realised by an individual but only through shared patterns of life. Language is one such quality; health is another: you cannot be healthy alone. The triumphs of Enlightenment reason came from suppressing this subject-subject worldview. Think of it as the difference between phoning home to say you are stuck in traffic and phoning to say that you are traffic. We tend to privilege a small subset of human knowledge based on abstract rationalism. In a complex world we need to expand our worldview to include ‘non-rational’ knowledge as found in the arts, music, intuition, acts of the imagination, embodied knowledge, the science of qualities as much as in the science of quantities. We also need to value collective knowledge that emerges in groups, knowledge that arises out of being in relationship (no one is as intelligent as everyone). Likewise, knowledge that rests in communities, indigenous knowledge. All knowledge is local, contextual, the product of a culture. In the West we have elevated some forms of knowing over others – see the syllabus at our elite universities. ...In Enlightenment thinking, the gold standard for what counts as knowledge is ‘justified, true belief’. But this second shift requires us to open the door to knowledge that we believe and that is true of the world, but cannot (yet, or by conventional means) be justified. The shift from organisation to integrity is … inspired by the work of Martin Albrow and his observation that the classic model of an organisation getting aligned to impose its will on the world no longer applies. Rather, any organisation is now a dynamic pattern of relationships between its own members and between them and an ever-changing world of competing loyalties and different value systems. It is a human system, a ‘human being’. Albrow calls this an ‘integrity’ – an organisational form that maintains a moral purpose over time. Individuals will belong to many different integrities: organisations, political parties, social clubs, the family and so on…. It is a defining characteristic of rationalist, Enlightenment thinking to make time a measurable and therefore a scarce resource. Other cultures see time as infinite rather than scarce and cyclical rather than linear. We tend to regard natural resources as infinite and time as limited when, if anything, it is the other way round. This fourth shift encourages us to change the way we pay attention to ‘things’ and to see and to manage flows rather than stocks, process rather than structure. As Heraclitus said: everything flows. ...Taking a cyclical view of time helps us to shift the way we think about endings, which are always an echo of our fear of death. We need to complete, to close well – understanding that this is what makes space for the next cycle. This shift in perspective pays attention to endings as much as beginnings (‘start-ups’), hospice work for the dying culture as much as midwifery for the new. The rationalist, Enlightenment perspective breaks complex systems down into discrete parts in order to understand them. This fifth shift requires a perspective that equally favours holism, ‘joining up’, connection, seeing things in patterns rather than in isolation. The shift from fragmentation to wholeness is also about meaning. Without some conception of wholeness, fragmentation leads to a loss of meaning, a world that no longer makes sense. Story is a powerful way of making wholes from disparate parts, weaving elements together to provide an instinctively satisfying sense of coherence. That is why the political battle today is less about ideas and more about shaping the narrative: it is the overarching stories we tell that influence how we see the world and the actions we regard as appropriate within it. Together these five principles offer generous prompting to expand our rationalist, Enlightenment consciousness to embrace other ways of knowing, thinking and making sense of the world and our place in it. In truth these perspectives were equally present in the 18th century – they were simply drowned out by more powerful voices. To restore our effectiveness in action we need to reclaim them." 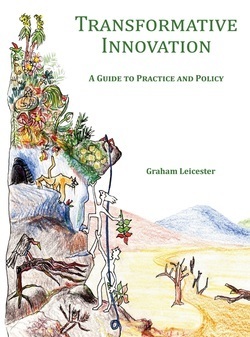 For a wonderfully practical guide to applying this kind of thinking to achieving transformative innovation in any organisation (but especially in the public and non-commercial sectors) see Graham Leicester's Transformative Innovation (published this week and launched fittingly in Edinburgh on Friday).